Paul Jorgensen backpedals down the court with the fans behind him. He is one of two seniors on the team. Collegian file photo. The Butler men’s basketball team will open Big East Conference play at home for the first time in three years with a matchup against Georgetown on Jan. 2, the Big East Conference announced today as the conference schedule was released. The opening game will be the second straight year Butler and Georgetown kick off conference play against each other. The Bulldogs will remain at home for their second conference game on Jan. 5 against Creighton. The team will then play three consecutive road games for just the second time as a member of the Big East from Jan. 9-16. Defending NCAA champion Villanova will come to town on Jan. 22, with Butler traveling to take on the Wildcats on March 2. In their final regular season home conference matchup, the Bulldogs will host Xavier for senior night on March 5. 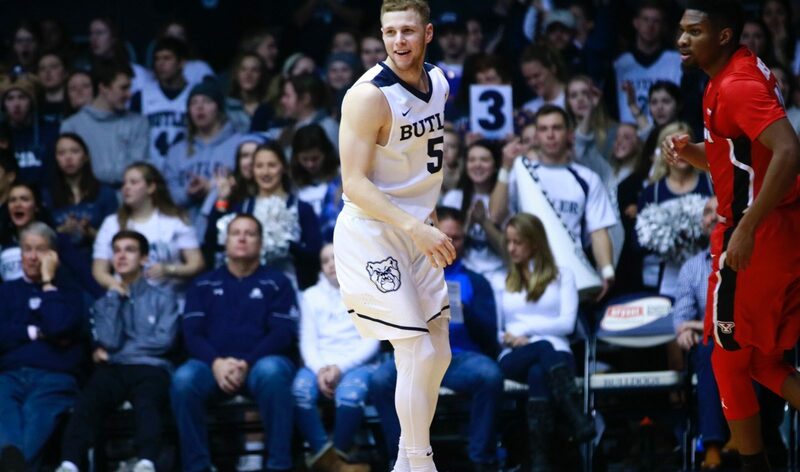 Also, Butler will take on Providence twice in their last four conference games, including their final regular season game on March 9 at the Friars. After facing Florida on Dec. 29 in their final non-conference contest, Butler will have four days before the start of Big East play.